USDA’s March 30 Prospective Plantings report, in my opinion, now gets us much closer to what will eventually be the acres planted number. The 13.5 million acre neighborhood or even higher is what has been expected by many observers, and that’s what USDA’s number is. So, we now have an acreage number that reflects recent strong prices and the potential that a lot of folks believed was there all along. So, now what? Will this larger number throw water on the fire that has been lit under prices for the past five months? The answer is “maybe not.” But a fuller explanation is quickly needed before we go off feeling too confident. Prices (December futures) had already made a small bit of an adjustment over the past couple of weeks, even before this report. We planted 12.61 million acres last year. 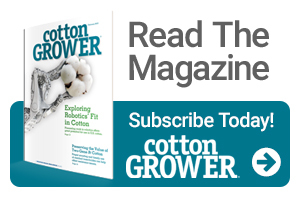 In early February, the National Cotton Council survey suggested 13.08 million acres. Later in February, the USDA annual Outlook Forum presented an estimate of 13.3 million. This recent number is 13.47 million. If realized, this would be 6.8% higher than last year. Cotton prices are higher and were higher this year during the survey period than at the same time last year. But corn and soybean prices are also higher. Apparently 78 cents December futures is not enough to universally coax additional land into cotton. Overall, acreage in the Mid-South is expected to be down slightly from last year. Louisiana is expected down 18%, Mississippi down 8%, and Tennessee up only just slightly. In the Southeast, Virginia growers say they intend to plant about 5% less cotton. A lot has been made of the Generic Base issue – or specifically the elimination of Generic Base, establishment of seed cotton base, and loss of the temporary base provision for acres planted to covered commodities. Specifically, that this could reduce acres planted to other crops (covered commodities) and acres shift back to cotton. There is not yet clear evidence that is the case. Planting intentions for soybeans are up or the same as last year in seven states. Intentions for corn are up or the same in eight states. Peanuts are produced in 11 of the 17 cotton states. For the most part, farms that grow peanuts also grow cotton. 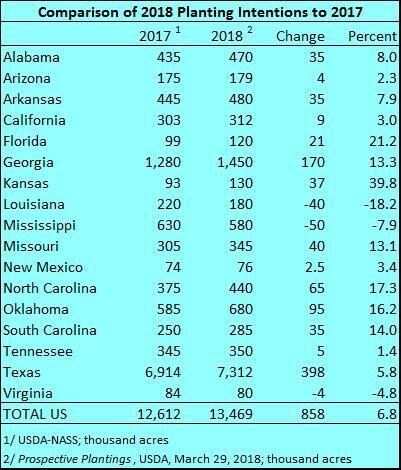 In these 11 states, planting intentions for cotton are up 333,000 acres, and intentions for peanuts are down 334,000 acres. 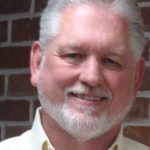 In Georgia, planting intentions for cotton are 170,000 acres higher than 2017. Planting intentions for corn, grain sorghum and soybeans are up a total of 65,000 acres. Peanut intentions are down only 115,000 acres. I believe the cotton number is spot on. If that’s the case, then it’s possible that peanut planting could come down further or that other crops will not be as high as estimated to balance these numbers a little better. Exports for the 2017 crop year continue to do well. The latest report shows that for the 7-day period ending March 22, sales totaled almost 319,000 bales and shipments about 467,000 bales. Sales for the marketing year now total about 15.5 million bales – 105% of USDA’s current 14.8 million bale projection of exports for the year. Shipments now total about 8.1 million bales. Over the past four weeks, sales have averaged about 354,000 bales per week and shipments about 486,000 bales per week. The USDA export projection will very likely be revised up in the April report. Many think exports will be revised to 15 million bales or higher in April or at some point. This will reduce the old crop carry-in to the 2018 crop year on August 1. Even with today’s higher acreage number, the market is still willing to pay more attention to the strength in demand and exports. December futures actually increased post-report and closed at near 78 cents. Downside risk seems limited as long as demand and exports are strong and until 2018 crop prospects are more firm. There is support at 76, then 74, and then 72 cents. But you don’t want the market to go there without you having already taken protection on a portion of the crop when prices were higher. Likely, the outlook for prices is eventually lower. But, admittedly, anything can happen.